The game tells the story of a young girl, who moves from the city to a farm on the country. While she is sad to leave her friends, her father has promised to buy her a horse! Riding and taking care of the horse is the central part of the game, but the game also has an adventure part with a mystery that needs to be solved. Now you can experience all of the thrills and excitement of looking after your own horse, providing it with all of the necessary attention and care that every horse needs. Feed, clean, groom, and brush your horse before taking it out to practice your riding skills. Brilliant game! 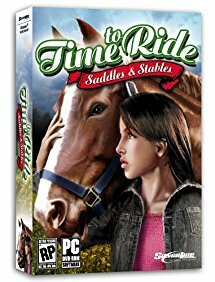 If you're looking for a good virtual and SIM horse game. Though I did enjoy the game until it cut out to the title mid plot and it had good graphics. I would say it is a poor game and unless you like stopping at climaxes or there about don't play it. I have found this point frustrating to a degree that I actually wrote the help line (something highly uncharacteristic of me) which was exceedingly UNhelpful. All I had asked was if that really was the end of the game and all they said was to check out forums. For those of you who have played you know what I'm talking about. For those of you who don't it is discovered. the boy in the town sort of shunns is discovered innocent of the accusation and evidence is found on a local land owner's property incriminating the owner. There is a team moment where the mains vow to get the actual criminal arrested. The cut to title and no more story/ plot advancement. If I am wrong and I would love to be, then great! But I have yet to find out how to do this and it has been sometime now. To put it mildly. I was also not the only one with this issue. All on the thread I was posting on had the same problem. i have this horse game. i love it, i love the Time to Ride: Saddles & Stables is good horse game.